We don’t know if there’s a heaven for animals, but we know for sure there’s a hell. If asked, how many of us would say we reject violence as a solution to the world’s problems? We condemn the brutality of IS; we are uneasy about the war in Syria; we are queasy about the so-called ‘intifada of knives’ in Israel/Palestine. As Remembrance Sunday approaches, we are even, at times, equivocal about the wars fought against imperialism and fascism in the twentieth century. It is all conveniently ‘out there’. Then we switch on the T.V. or radio or dip into Social Media and discover the violence is not ‘out there’ at all. It is within each of us, and it is beginning to make monsters of us. You may think that last statement over the top, but think for a moment. How often do we encounter vehement language and insults in situations where they are inappropriate or counter-productive? We do not need to tell a prominent politician to ‘**** off’. We’d do much better to argue a case he/she has to answer, but we are too lazy to do that. Much easier to rant and rage instead. During the recent Synod on the Family we were treated, if that is the right word, to endless bandying of insults and accusations which achieved nothing of value. Much of the violence we express has, objectively speaking, little to do with the situation we are allegedly upset about but everything to do with us. We want to vent our own feelings, and sometimes we forget that doing so may have a negative effect on others. Perhaps we don’t care. What matters is us and our views and their unbridled expression. Unfortunately, that tends to undermine the value of whatever we have to say. We cannot plead for peace and justice unless we ourselves are prepared to be peaceful and just — and a vicious little outburst rather gives the game away about what is actually going on inside. I said yesterday we cannot change others, only ourselves. Maybe we could spend a few moments today thinking about how we react to situations and events that we believe wrong or which make us upset or angry. We can contribute to the world’s violence or we can lessen it. Blessed are the peacemakers for they shall be called children of God. Better that than ‘spawn of Satan’ surely? This isn’t an oblique reference to Back to the Future but a brief thought about something most of us need more than we realise: the habit of taking a few moments throughout the day to pause our activity, go into ourselves, as it were, and emerge with a more thoughtful, more purposeful grasp of what we are about. The Latin word from which we get ‘recollection’, recolligere, means ‘to gather back’; and I think most of us understand how easily we become dispersed or unfocused in the course of the day. For monks and nuns it is easier, of course. We have the structure of the Divine Office to remind us, at regular times, of God and the things of God. But in a busy life, where the majority of the people we meet probably have little religious understanding, we’d be thought odd, if not actually mad, were we to make any kind of physical withdrawal in order to pray. Unlike our Jewish and Muslim friends, we Christians have largely abandoned the ancient practice of formal prayer at set times throughout the day. That doesn’t mean, however, that we have to give up the idea of turning to God in the course of our everyday life. We can practise recollection anywhere and at any time. There are many opportunities for finding a moment or two to recollect ourselves. Walking from one floor to another (you do take the stairs, not the lift, don’t you? ), before switching on the car, while waiting for the kettle to boil, we can turn to God interiorly and simply lay before him all that we are and do. Grace works to a timetable of its own. All we have to do is open ourselves to it; and that doesn’t take very long or require ‘optimum conditions’. How about making ‘Give grace a chance’ our slogan for today? Today’s section of the Rule, RB 7. 10–18, is like a bucket of cold water over one’s head. It pulls one up sharp with its reminder that what we call ‘the spiritual life’ is quite the opposite of that deliciously dreamy, pseudo-mystical stuff peddled by religious charlatans. Humility begins with mindfulness, with remembering God, keeping the fear of him before our eyes at all times, and guarding ourselves at every moment from those sins of inattention into which we so easily slip. It is an active and earnest pursuit which transforms our whole way of life. God’s gaze is always upon us. To some, that is terrifying; but if we reflect a moment, it is really quite the opposite. We know — or should do — that our merciful Lord wills us nothing but good. The fact that he is always with us, closer to us than we are to ourselves, should be a source of joy. Our problem is that we are too busy looking elsewhere, too caught up in our own ideas, that we don’t notice; and not noticing is where all the trouble begins. The sins of omission, the sins of inattention, are like a great pile of dead leaves around our ankles. They clog our way, hold us back, keep us from beginning to climb the ladder of humility, because they obscure its first step: awareness of God. There are advantages to being a nun when General Elections are held. One goes to bed at the usual hour then awakes to a world a-buzz with comment. Twitter this morning is awash with tweets containing a degree of infallibility that might surprise even the pope. For some, we face disaster; for others, a golden era beckons. Both are wrong. What we face is largely unknown. We know there will be some very important decisions to be made — about our place in Europe and the shape of the Union, for example — but the predictable is often blown out of the sky by the unforeseen. We are not just a small group of islands able to live wholly self-sufficiently. What happens in Washington, Beijing or Moscow, in the boardrooms of multi-nationals or on the streets of Syria or Iran, can have a huge effect on what happens here. Even the actions of a single rogue trader, manipulating stock markets, or someone anonymously hacking the IT systems of a nation state, can have immense consequences for us. Today brings us not only the General Election results but also a reminder of VE Day, the seventieth anniversary, in fact. World War II may seem a distant event to many, but we live with its consequences, both good and bad, even today. As we remember those who gave their lives for the freedoms we now enjoy, and reflect sadly that the world is still at war in many places, we can also reflect on both the fragility and strength of our democratic processes. We need to pray for H.M. Government, H.M. Opposition, the Civil Service and all who have a role to play in the business of government and the implementation of policy. We may like or dislike individual parties and their policies, but the important thing is surely to try to do the best we can for everyone — to put into action what we, as Christians, often claim to have: a sense of moral purpose, a commitment to the common good, a desire to be of service to others. These are not small things, but they can be hard to achieve. Many today will also be quietly celebrating Julian of Norwich and her wise and generous vision of a world in which all shall be well, because it is held fast by the hand of God. That hope and vision are a comfort and inspiration, but they require our co-operation to be realized. The General Election is the end of one process and the beginning of another, just as much as VE Day marked the end of the war in Europe and the beginning of the building of the peace. The one thing we can safely predict is that it isn’t going to be easy. Everything would be so much easier if we could be, like James Hogg, a justified sinner and never have to worry whether our conduct is right or wrong. Catholicism, however, takes another James for her guide and insists that we demonstrate the reality of our faith through our good deeds. Not surprisingly, St Benedict takes the same view. Today’s section of the Prologue goes into some detail about these good deeds we have to perform. They are not to be mere occasional outbursts of godly behaviour, they are to be constant. It is not so much doing good we have to aim at as being good. The verbs Benedict uses are exhausting: we have to run, walk, act, speak, believe, hurl, dash and then glorify, all at once. Quite clearly, monastic life is not for wimps and being virtuous is not for the lazy or faint-hearted. There is one theme, however, that stands out about the rest: the centrality of Christ. The only effective way of dealing with temptation is to take it to Christ, and not in some limp and effete manner but with vigour and purpose. We are to hurl the devil and his temptation from our hearts, dash our half-formed thoughts against Christ. It is easy to forget that; to think we must struggle and struggle on our own when, in reality, the opposite is true. Often we don’t want to acknowledge our temptations, even to ourselves. We are ashamed of them; and it is shame, often as not, that gives them their power. The old monastic tradition of ‘manifestation of thoughts’ has profound psychological as well as spiritual truth in it. Today will present each of us with many choices, many temptations, many opportunities. God doesn’t ask us to ‘get it right’ all the time, but he does ask us to be truthful about our failures and humble about our successes. What he wants is love, not sacrifice. Our good deeds are important insofar as they draw us closer to him, but we must always remember they are his work in us, and to him be the glory. Before we look at the Resurrection gospels to which I referred yesterday, we need to take a brief look at the way in which the Church has developed her teaching about mercy and forgiveness, and St Anselm, whose feast we keep today, is necessarily important. In Cur Deus Homo (‘Why God became Man’), Anselm articulated a theory that has been hugely influential in the Western Church. 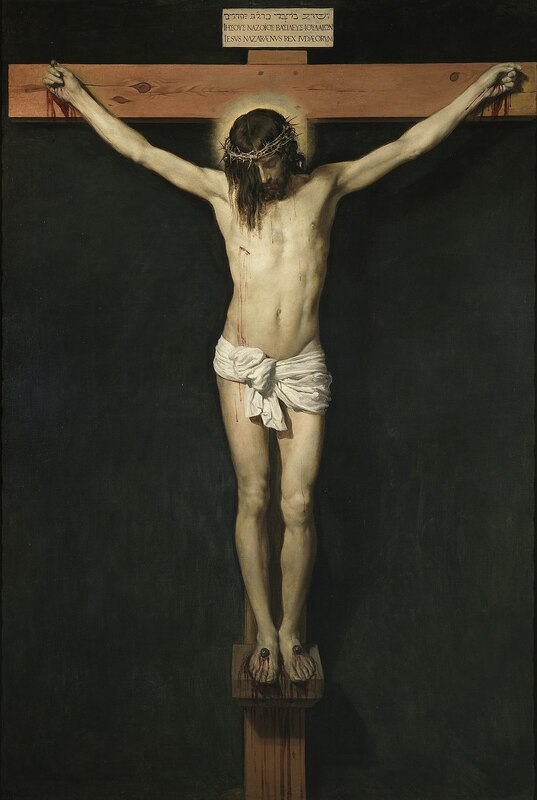 He asked himself the question, what is the meaning and purpose of the Crucifixion of Christ? The answer he gave was that human beings had sinned gravely and incurred a debt to God. Only a human being could recompense God for sin, but the insult to God was so great that no human being could actually do so, only one who was both God and man, himself completely sinless and therefore not in debt to God. Christ alone satisfies these conditions. Hence we can speak of the Atonement, when Christ, as both God and man, paid the debt incurred by human beings and satisfied divine justice through his death on the Cross. The Crucifixion thus becomes a punishment for sin, our sin; and many theologians in the Reformed tradition have made this satisfaction theory of the Atonement a test of Christian orthodoxy, seeing Christ as a punitive substitute for us. Philosophically speaking, Anselm’s argument is beautiful; theologically, it introduces one or two more doubtful elements. For a start, the idea of sin as a debt to God is rather less easy to reconcile with biblical notions of sin than may at first appear. We are indeed alienated from God by sin, which ruptures the relationship of love and trust to a greater or lesser degree. We profane the holiness of his great name by failing to live a holy life. If we stopped to consider that, would any of us ever sin? I rather doubt it. But we choose lesser ‘goods’, the satisfaction of some current desire and end up in some sense distant from God, conscious of an unfulfilled obligation which we describe as being in debt to God. Think about that seriously, and one can see that we have nothing we can call our own in the first place. If we owe everything to God, how can sin place us further in his debt? We tend to talk about our ‘fallen nature’ without really thinking what we mean by it: essentially something evil (i.e. opposed to God), or essentially something sick (i.e. in need of redemption)? Our answer may be significant. Here it may be helpful to consider another way of regarding sin. Where we in the West tend to think of our fallen nature as intrinsically evil, our brethren in the East tend to think of it as intrinsically disordered, sick, something that needs to be restored to full health and vigour. Sin is missing the mark rather than incurring a debt. The Orthodox reject the idea that Christ died to satisfy divine justice as taught by Anselm, or as a punitive substitute as taught by the Reformers. Sin (separation from God, the source of all life) is its own punishment, capable of imprisoning the soul in an existence without life, without anything good, and without hope: hell, by any definition. The death of Christ on the Cross restores life and health to humanity, restores the relationship with God and indeed permits a new creation as the Church is born from the blood and water that flows from his side. In practice, both views of sin and of the meaning of the Crucifixion can enlarge our understanding and sense of wonder and gratitude. The problem comes when we want to nail other people and demand of others our own concept of repentance and the satisfaction of our own ideas of justice! Tomorrow I hope to argue that we need to be much more circumspect in attributing to God ideas that are not his. Certainly, repentance, conversion, literally changing our course, is a necessary part of Christian living, but we need also to be aware of that unmerited gift of God’s grace that flows so freely upon us all. In the Parable of the Prodigal Son, Luke shows us the sinner being forgiven by his father before the words of sorrow and apology had fully fallen from his lips. It was enough that he had turned back to meet the overwhelming love that had watched and waited for him for many a long day. How many of us, deep down, hope that we shall be embraced with such a love when our own time comes? Today in our monastic calendar is the feast of SS Martha, Mary and Lazarus, about whom I seem to have written a great deal in the past. Typically, I have written about this feast as a feast of friendship and hospitality, noting also that we have our Martha days, when life seems all work, our Mary days, when life seems all bliss and our Lazarus days, when we have to go into the tomb with Jesus and experience resurrection in a new and painful way. Today, however, I would like to think about this feast in relation to the second section of RB 48, On Daily Manual Labour, verses 10 to 21. The first thing that strikes one about this passage of the Rule is that it is almost wholly concerned with lectio divina, that slow, prayerful reading characteristic of the Benedictine. Why? I think it is a reminder that we have to work at cultivating our friendship with God, just as Martha had to work at serving the Lord when he visited her household in Bethany. Dinner didn’t just happen: it had to be prepared, cooked and served before it could be shared. So, too, with us. We have to prepare ourselves for prayer, concentrate, abandon ourselves to an activity which seems to matter so much to God. It requires effort, even sacrifice, but most of all, it demands fixity of desire and purpose: I want to be friends with God; I will do everything I can to become friends with God. We don’t become friends with God just by wishing. We have to give him time, not just any old time, but ‘quality time’. We have to lavish time upon him, in fact, lavish love and attention on him, as Mary lavished ointment on the Lord’s feet and sat to listen to his teaching. Others, even those we are closest to or who we think understand us best, are likely to be puzzled by this. We shall be challenged to do something constructive, as Mary was challenged by Martha, but we must hold to our purpose because, in truth, there is no other way of becoming friends of God. Finally, we must go through the Lazarus experience: feeling that we have been abandoned by God, plunging into a dark place where all we seem to know is death and destruction and hope turns to ashes. This too has to be worked at. There are many surrenders into the hands of God that must be made before we make the final surrender of death; and just as Lazarus had to rely upon his sisters to bring the Lord to his tomb, so there are times when we have to rely upon the prayers and good deeds of others to help us. That is what the Communion of Saints means. It is the great circle of friendship embracing both the living and the dead which draws us into the life of the Trinity. Deus amicitia est, ‘God is friendship,’ said St Aelred, the great Cistercian writer on Christian friendship. ‘I have called you friends,’ says Jesus in St John’s Gospel. And as Pope Emeritus Benedict XVI remarked, quoting Sallust, to like and dislike the same thing is a mark of friendship. Our friendship with God isn’t, first and foremost, about feelings: it is about willing and doing the same things. Both St Benedict’s chapter on work and today’s celebration of SS Martha, Mary and Lazarus may suggest ways in which we can deepen our friendship with God and, incidentally, become better friends with one another.